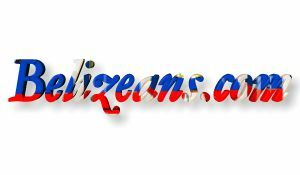 The red, white and blue flag of Belize is a symbol of the unity of our nation. Prior to Independence the People's United Party (PUP) proposed a blue flag with the Coat of Arms in a white circle. Because of the close association of the flag with the PUP, public opinion was divided as to its suitability to act as a unifying symbol. The United Democratic Party (UDP) did not propose a flag, but called for a flag that could rally all citizens, regardless of their political affiliation. As a consequence, the bi-partisan National Symbols Committee invited citizens to submit designs for a National Flag. The design selected by the Committee is a royal blue flag with one horizontal red stripe at the top, one at the bottom, and a white circle with the Coat of Arms in the centre. The shield of the Coat of Arms is divided into three sections by a vertical line and an inverted V.
The base section represents a ship in full sail on waves of the sea. The two upper sections show tools of the timber industry in Belize: a paddle and a squaring axe in the right section and a saw  and a beating axe in the left section. Supporting the shield are two woodcutters, the one on the right holding a beating axe over his shoulder in his right hand, and the one on the left holding a paddle over his shoulder in his left hand. Above the sheild rises a mahogany tree. Below the sheild is the motto scroll. A wreath of leaves encircles the Coat of Arms. The Coat of Arms embodies an important aspect of the history of Belize, as the mahogany industry formed the basis of our economy in the 18th and 19th centuries. NATIONAL MOTTO: "Sub Umbra Florero" - These latin words mean, "Under the shade I flourish." 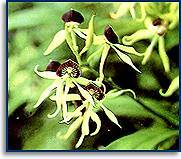 The Black Orchid (Encyclia Cochleatum) is the National Flower of Belize. This orchid grows on trees in damp areas, and flowers nearly all year round. Its clustered bulblike stems vary in size up to six inches long and carry two or three leaves. The black orchid flower has greenish-yellow petals and sepals with purple blotches near the base. The "lip" (one petal of special construction, which is the flower's showiest) is shaped like a valve of a clam shell (hence the name Encyclia Cochleatum) and is deep purple-brown, almost black, with conspicuous radiating purple veins. The Mahogany Tree (Swietenia Macrophilla) is one of the magnificent giants of the forest. Rising straight and tall to over a hundred feet from great buttresses at the roots, it emerges above the canopy of the surrounding trees with a crown of large, shining green leaves. In the early months of the year, when the leaves fall and new red-brown growth appears, the tree can be spotted from a great distance. The tree puts out a great flush of small whitish flowers - the blossom for dark fruits, which are pear-shaped capsules about six inches long. When the fruits mature they split into five valves, freeing large winged seeds which are carried away by the wind. They fall on the shaded protection of the forest floor and germinate to begin a new life cycle. The mahogany tree matures in 60 to 80 years. British settlers exploited the forest for mahogany, beginning around the middle of the 17th century. It was originally exported to the United Kingdom in the form of squared logs, but shipment now consits mainly of sawn lumber. The mahogany tree forms part of Belize's Coat of Arms. The motto "Sub Umbra Florero" means: Under the shade (of the mahogany tree) I flourish. The Keel Billed Toucan (Ramphastos Solfurantus) is the National Bird of Belize. It is noted for its great, canoe-shaped bill, brightly colored green, blue, red and orange feathers The bird is about 20 inches in overall length. It is mostly black with bright yellow cheeks and chest, red under the tail and a distinctive white patch at the base of the tail. 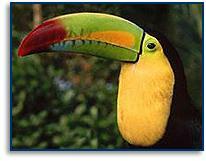 Toucans are found in open areas of the country with large trees. They make a monotonous frog-like croak. Toucans like fruits, and eat by cutting with the serrated edge of their bills. Toucans nest in holes in trees, using natural holes or holes made by woodpeckers, often enlarging the cavity by removing soft, rotten wood. They lay two to four eggs which are incubated by both parents. The nesting stage lasts from six to seven weeks. The Tapir or Mountain Cow (Tapirello Bairdii) is the largest land mammal of the American tropics. The tapir is a stoutly built animal with short legs, about the size of a donkey and weighs up to 600 pounds. Its general color is dusty brown with a white fringe around the eyes and lips, white tipped ears and occasional white patches of fur on the throat and chest. In spite of it's local name, the tapir is not a cow. It is closely related to the horse and is also kin to the rhinosceros. The tapir is a vegetarian. It spends much of its time in water or mud shallows, and is a strong swimmer. 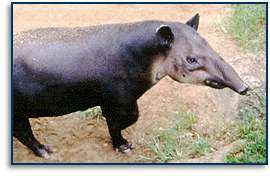 The National Animal is protected under the wÀildlife protection laws of Belize, thus the hunting of the tapir is illegal.